Chikmagalur is one of the most picturesque and tranquil tourist destinations in Karnataka. At a height of about 3400 ft, Chikmagalur is a very high hill station and there are many places to visit there. It is famous for its coffee estates and favourable climate. Chikmagalur gets its name from "Chikka magala ooru", which translates to "younger daughter's town". It is said to have been given away as dowry to the younger daughter of Rukmangada, the chieftian of Sakhrayapattana. This perfect scenic getaway is dotted with heritage spots and adventure options with wildlife and nature themes. By Air: Mangalore airport, at a distance of 113 km, is the nearest airport to Chikmagalur. 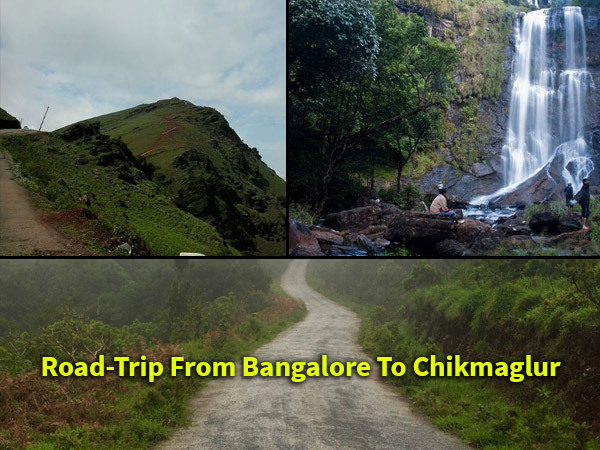 You can take a flight from Bangalore to Mangalore and then a prepaid taxi to get to Chikmagalur. By Rail: Chikmagalur does not have a railway station. Kadur is the nearest railway station. It is 40 km away from Chikmagalur. By Road: There are many private and Government buses that ply from Bangalore to Chikmagalur. However, if you plan on taking a road trip; then there are 3 routes. The driving distance from Bangalore to Chikmagalur is approximately 250 km. Route 1: Bangalore-Kunigal-Channarayapattana-Hassan-Belur-Chikmagalur on NH 75. Route 2: Bangalore-Kunigal-Tiptur-Arsikere-Halebidu-Chikmagalur on NH 75 and 73. Route 3: Bangalore-Tumkur-Hiriyur-Hosadurga-Kadur-Chikmagalur on NH 48. Route 1 is the shortest in terms of distance and time. It takes about 4.5 hours and takes you through the beautiful town of Hassan and the historic town of Belur. The roads are great and offer a fantastic ride. However, sometimes there might be expansion/repair work going on and therefore it is safe and advisable to factor this in while planning the journey. For those of you planning on taking Route 2, it takes almost 5 hours. This passes through the famous twin cities of Belur and Halebid. Route 3 is the longest in terms of distance and time. It takes about 6 hours to reach Chikmagalur if you take the NH 48. Watching the scenery change from barren surroundings to one with abundant greenery on either side is an extravagant experience for a road trip from Bangalore to Chikmagalur. There are quite a few places to visit in and on the way to Chikmagalur. Accordingly, it is best to plan this journey on a weekend or a long weekend. You can stop at Kunigal and enjoy the Begur lake. Adichunchungiri, which is a religious and spiritual headquarters of the Vokkaliga community, is on the way. If you take a small detour, Shravanabelagola is only a few miles away. The Gomateshwara statue is one of the most important tirthas of Jainism. You can visit Gorur Dam, which is 20 km from Hassan, on river Hemavathi. Situated at 13 km from Hassan is the famous Drowning Church which submerges underwater during monsoons and resurfaces once the rains die down. The temple circuit of Belur and Halebid is a short bypass when driving from Bangalore to Chikmagalur. These temples were constructed during 11th-13th century under the regimen of the Hoysala kings. Though 92 temples were built around the time, only 3 viz., Somanathapura, Belur and Halebid flourish to date. Ensure you engage the services of a guide to explain the nuances of the Hoysalan architecture. You can stop at Yagachi dam on the way and indulge in a Banana boat ride as well. This is the highest peak in Karnataka and is located in Chikmagalur. The height of Mullayangiri is approximately 1930 m, and has some gorgeous trekking trails. This peak is another tourist favourite at Chikmagalur. It gets its name from the Muslim saint Baba Budan who lived in this area more than 150 years ago. It is also said that coffee was first planted in India in this range by Baba Budan, who sneaked 7 seeds of coffee in his belt while returning from Mecca. This hill station is at an altitude of 1400 m and houses the summer home of Sri Krishnaraja Wodeyar IV. It has a rock garden, children's park and many view points, from where you can enjoy the scenery. It is about 10 km from Kemmangundi, where the water streams down in two stages to form Dodda Hebbe and Chikka Hebbe. The falls are isolated and any help takes time to reach, therefore discretion is advised and it is recommended to stay at its fringes. The falls flow generously only during monsoons, this also means that the forest would be infested with leeches. Take a small sachet of salt to get rid of them. Do take some time out to learn how and from where your morning cuppa joe comes from. Miles of stunning vista, large amount of greenery and the whiff of coffee accompany the perfect weather. If you are planning to witness the stunning sunset and sunrise views, Z point offers the perfect vantage point. White water rafting is very famous at River Bhadra. However, if this is your main programme of the trip, then it is recommended to set aside a good chunk of time because the rafting spot lies quite far from the Mullayangiri sector of Chikmagalur.